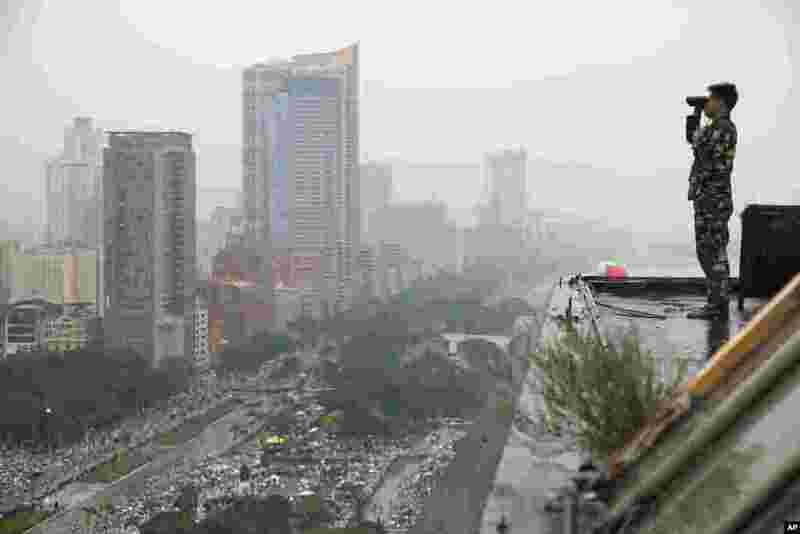 5 A military scout watches the motorcade of Pope Francis as he arrives at Rizal Park to celebrate his final Mass in Manila, Jan. 18, 2015. 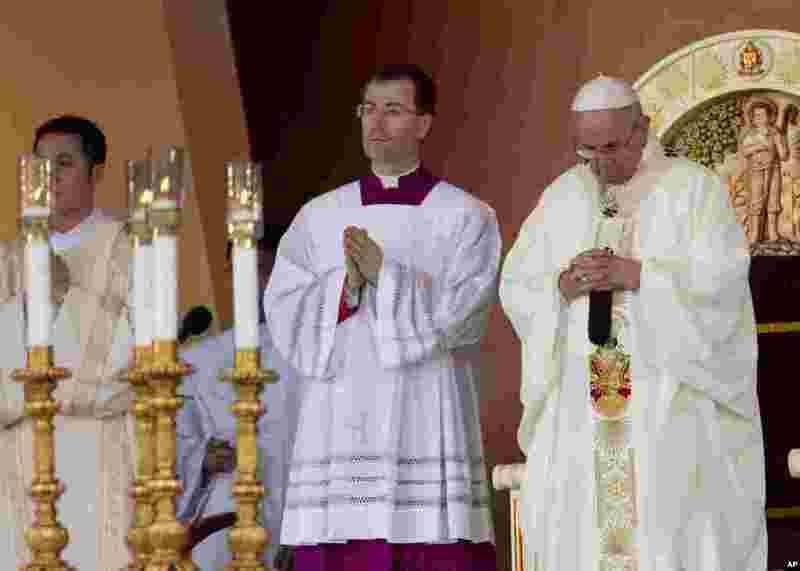 6 Pope Francis shakes hands of the faithful after celebrated his final Mass in Manila, Jan. 18, 2015. 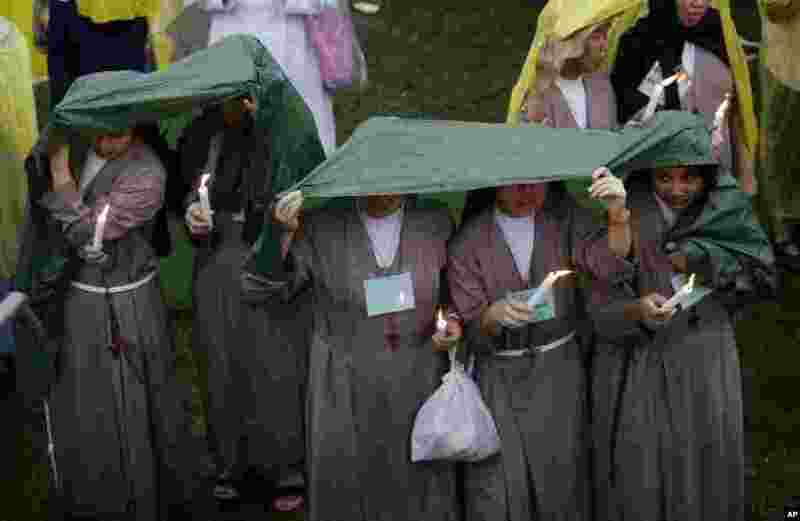 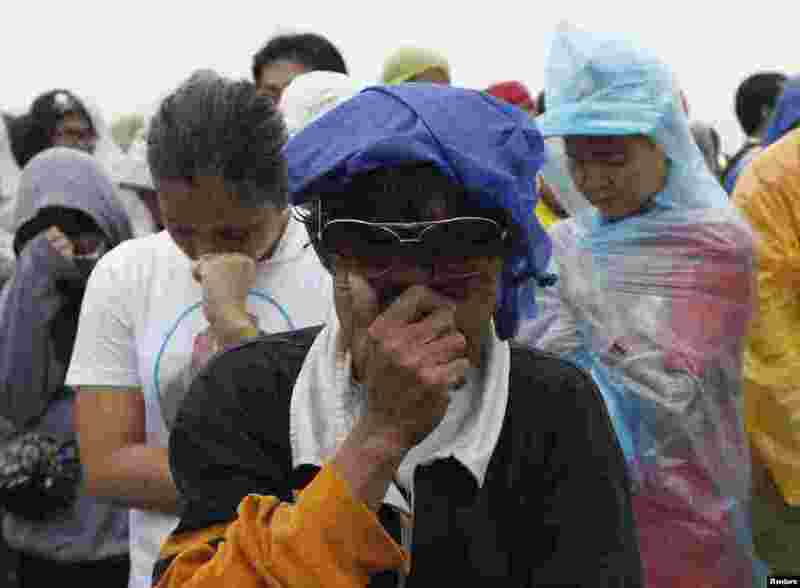 7 Filipino nuns hold candles in the rain as Pope Francis celebrates his final Mass in Manila, Jan. 18, 2015. 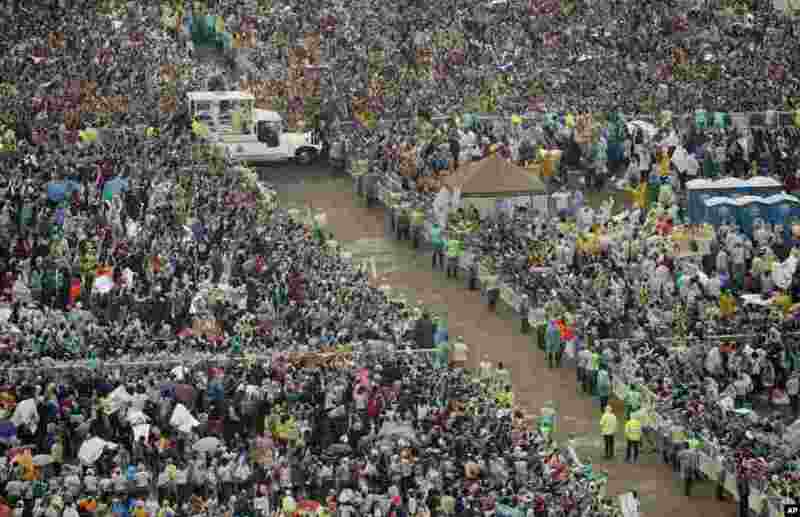 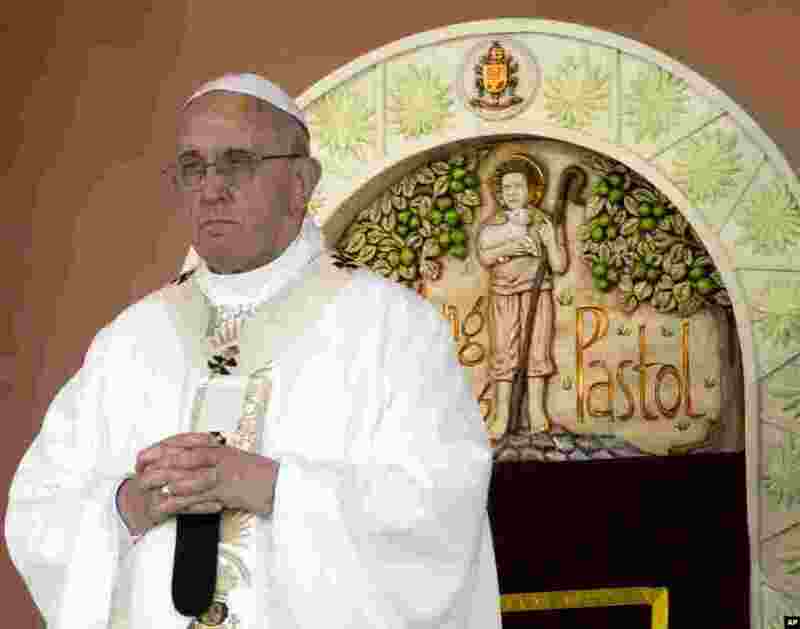 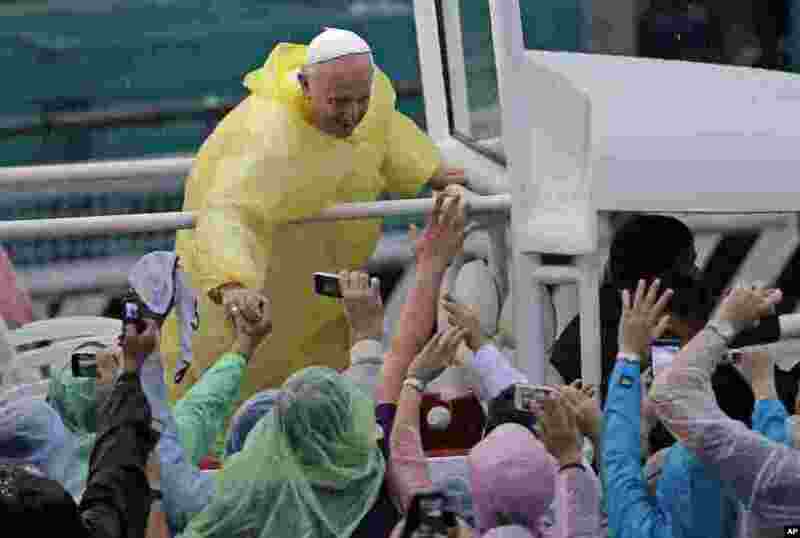 8 Pope Francis arrives for a Mass at Rizal Park in Manila, Philippines, Jan. 18, 2015. 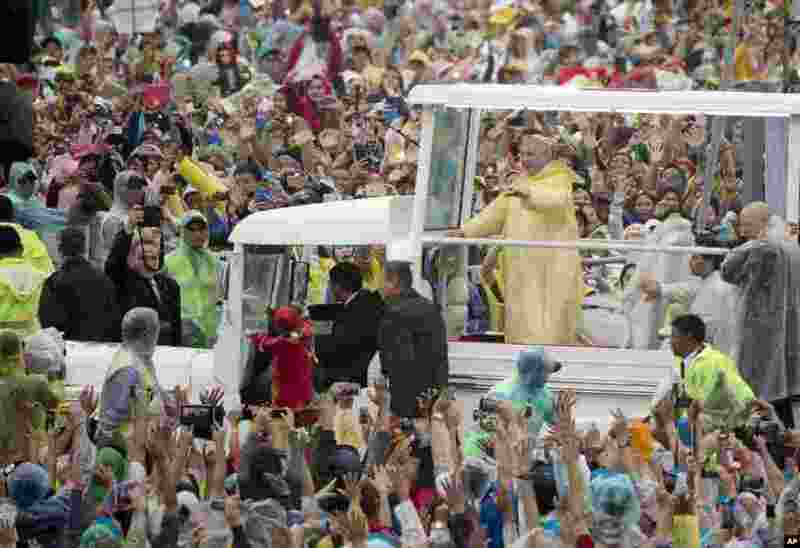 9 Pope Francis, in vehicle, waves to the faithful as he arrives at Rizal Park to celebrate his final Mass in Manila, Jan. 18, 2015. 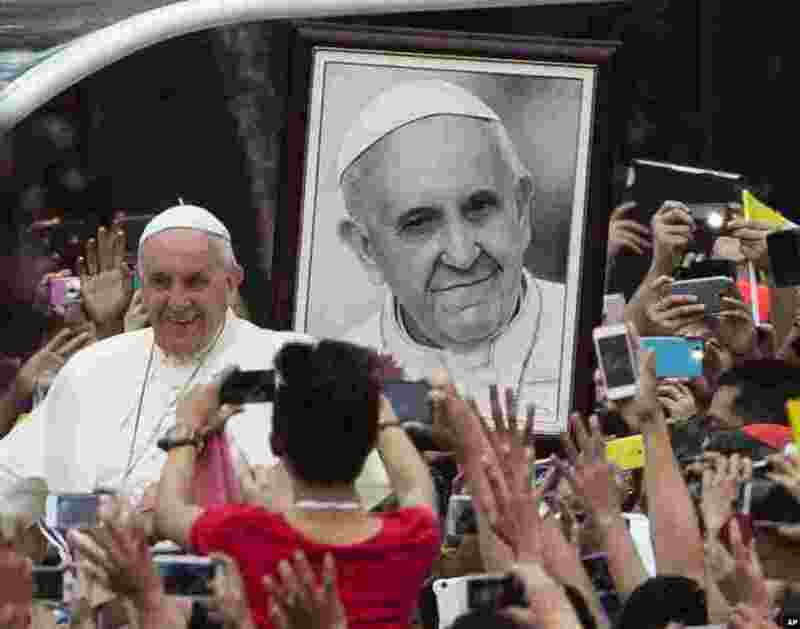 10 Pope Francis passes a portrait of himself as he arrives to meet youths in Santo Tomas University in Manila, Jan. 18, 2015. 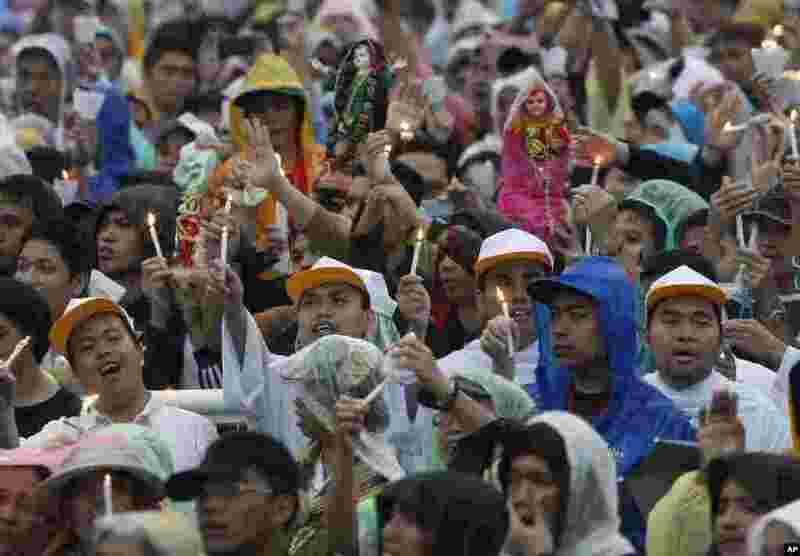 11 Filipinos hold lit candles to celebrate the Feast of the Santo Nino during a Mass officiated by Pope Francis at the Quirino Grandstand in Manila, Jan. 18, 2015. 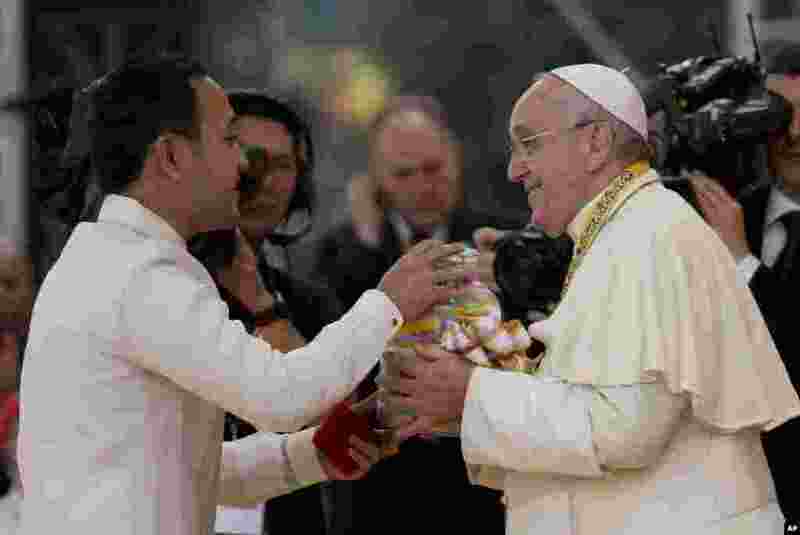 12 Pope Francis is presented with a jar containing messages of former street children during his meeting with the youth in Santo Tomas University in Manila, Jan. 18, 2015. 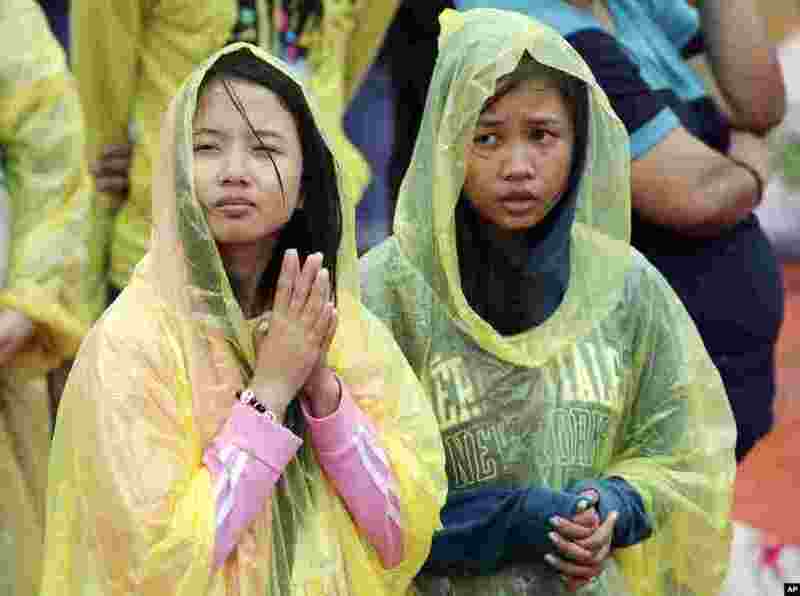 13 Young Filipino women pray during the visit of Pope Francis at the University of Santo Tomas in Manila, Jan. 18, 2015. 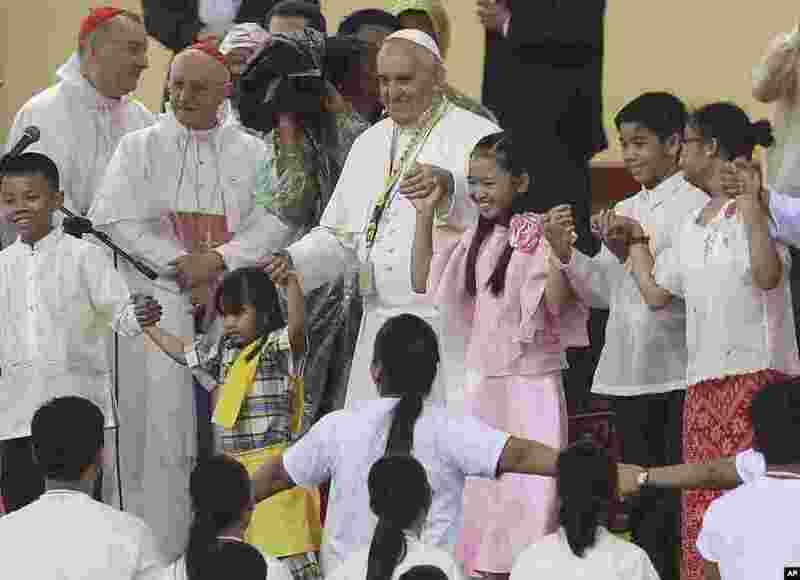 14 Pope Francis, center, dances with Filipino children during his meeting with the youth at the University of Santo Tomas in Manila, Jan. 18, 2015.